Bulk single crystals doped with rare earth ions are known to have very long optical coherence lifetimes and extremely long nuclear spin coherence lifetimes. This combination makes it possible to coherently address nuclear spins with a laser via an optical transition, with high spatial and spectral resolution. These materials are very promising for optical quantum memory, where the spin levels can be used to store quantum information carried by photons. However, an improved selection of high quality materials is still necessary for many applications. Our team at Institut de Recherche de Chimie Paris is developing smarter and better rare earth materials for quantum technologies, including single crystals, ceramics, and nanoparticles. While some rare earth doped single crystals have been well characterized, little is known about the coherence properties of rare earth ions in polycrystalline samples where the crystalline regions are small, for example, ceramics and nanoparticles. In this work we investigate the nuclear spin coherence properties of Eu3+ ions in a transparent ceramic sample of Eu3+:Y2O3, using an all-optical technique. Ceramic samples offer a higher degree of flexibility and ease of fabrication compared to single crystals, and transparent ceramics have very good optical properties. We discover that the long nuclear spin coherence time of Eu3+ ions, previously measured only in single crystal Eu3+:Y2SiO5, is preserved in a ceramic sample with micron-sized crystalline regions. 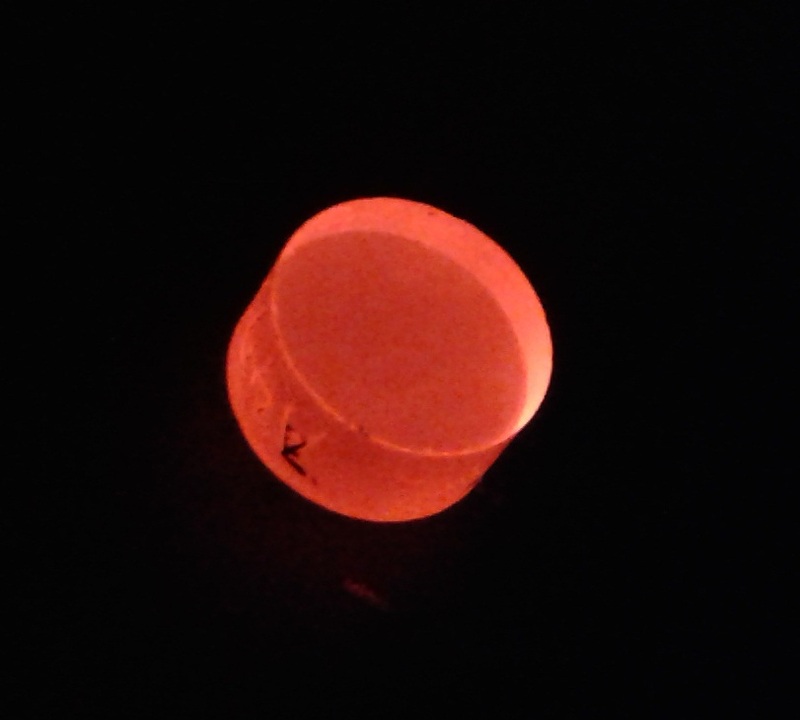 A transparent ceramic sample of Eu3+:Y2O3, fluorescing under a UV-lamp. © 2017 Jenny Karlsson. All rights reserved. Moreover, the nuclear spin coherence time is constant up to about 18K, and thus allows storage of quantum states with relaxed cryostat requirements. No additional dephasing mechanism was observed in the ceramic compared to single crystals at temperatures between 3K and 22K. Eu3+:Y2O3 is also a suitable material for creating nanometer sized crystals, which are ideal for single ion detection and strong coupling to photons via small cavities. Our team led by Philippe Goldner is currently coordinating NanOQTech, a project under the European Union’s Horizon 2020 research and innovation program, with ambitious goals of developing nanometer-scale rare earth doped materials for optical quantum technologies. Our research demonstrating that coherence lifetimes of Eu3+-spins are preserved when going from macroscopic crystals to microscopic crystallites in a ceramic is a promising first step towards this goal. Dr Jenny Karlsson completed her PhD in engineering physics in 2015 at Lund University, Sweden. The main focus was quantum computing using rare earth doped crystals. In 2016 she moved to the group of Philippe Goldner at Institut de Recherche de Chimie, Paris for a postdoctoral position, where she is now working with coherent spectroscopy and characterization of new rare earth materials. Dr Nathalie Kunkel studied chemistry at the Saarland University and obtained her diploma in 2010. After completing her PhD in 2014 and a short postdoctoral stay at Leipzig University, she moved to Philippe Goldner’s group as a postdoctoral fellow. In October 2016 she established a junior research group at the Technical University of Munich, Chemistry Department, supported by a Liebig fellowship of the Fonds der Chemischen Industrie. Currently, she is studying the optical properties of rare earth doped hydrides, borohydrides and mixed halide hydrides. Dr Akio Ikesue completed an Eng D in material engineering from Nagaoka University of Technology, Japan, in 1996. He is the founder and CEO of World-Lab. Co in Japan. He demonstrated “High Efficiency Polycrystalline Ceramic Laser Materials” for the first time and is developing ceramic optics for various applications like lasers, scintillators for X-rays and γ-rays, phosphors for LEDs and Faraday rotators etc. He has received numerous awards, including the Progress award from the Laser Society of Japan, the Photonics and Quantum Electronics award from the Applied Society of Japan, the Fulrath award from Am. Ceram. Soc. And the Otto-Schott Research award from Ernst-Abbe Foundation (Germany). He is fellow of the American Ceramic Society and visiting professor of Nagoya University. Dr Alban Ferrier completed his PhD in materials science in 2007, working on rare earth doped low-phonon materials for mid-infrared lasers. He was then appointed a post-doctoral fellowship on solid state lasers at Institut Saint Louis, and afterwards on nanowires and quantum dots at IEMN in Lille. In 2009, he joined the UPMC Sorbonnes-Université, where he is presently associate professor. His research concerns the development of optimized materials (single crystal, nanocrystals and ceramics) for photonic applications, in particular in the field of quantum processing. Dr Philippe Goldner is a CNRS senior researcher at the Institut de Recherche de Chimie Paris, where he moved about ten years ago. He is currently heading the team Crystals and Quantum State Dynamics, which aims at designing and growing rare earth doped materials with long lived quantum states for application in quantum technologies and optical signal processing. The Institut de Recherche de Chimie Paris (Paris Institute for Chemical Research) is a joint unit between Chimie ParisTech graduate school and the CNRS (Centre National de la Recherche Scientifique). Devoted to a broad range of topics in chemical sciences, it was founded in 2014 and has about 200 staff members.